My lovely writer friend, Lilac Shoshani, asked if she could interview me on my upcoming debut. Of course I said, YES! Lilac is a New Age Nun who cares deeply about those around her. She lives in the city of Tel Aviv, where she writes speculative fiction and these wonderful little vignettes of her day to day encounters with humanity for her blog. I thoroughly enjoyed my time with her! Before writing this, I thought about how many other people have gone before me and shared about promotion and how it “sits” with them. I’ve read tons of articles, tweets, FB posts, blog posts about this part of publication and how many authors have a kind of a love/hate feeling about it. I’m on the fence, and really have no strong feelings in either direction (yet). Back when I worked at International Telephone and Telegraph (ITT, and tell me that doesn’t show some AGE. Hello, telegraph???) now called Alcatel Lucent, I was let go after nine years with the company. I got a job selling ITT key systems for a subsidiary known as Metro Telecom, Inc. I HATED that sales job. I had to “cold call.” Walk into some business at random, ask to speak to the manager, or the person in charge, and try to tell them to spend thousands of dollars, just like that! (snaps fingers) on a new phone system. You can imagine how successful I was. It’s really the only sales job I’ve had – until now. Granted, book promotion is different. It’s not cold calling, for one, unless I decide to contact people in a mailing list to persuade them my book is something I think they’d enjoy. That’s not my thing though. I’d rather use a mailing list to send news about events, special prices, or share how the book is doing. I don’t plan to email anyone and ask them to buy the book. On my Ick Factor Scale (IFS) it ranks a -1 bazillion out of 10. And notice that acronym? IFS? Yeah. I can imagine people reading that email and thinking, uh huh, well, that’s a big IF, alright. There are many ways to promote a book without sounding like a carnival barker. As some of you know, I just did a traditional sort of ARC giveaway. That’s a book promo I think works. The publicist has suggested we do a Goodreads giveaway next month, and I think that will also be another wonderful way to promo. In other words, when I can give something, it makes me feel better. Be it time to answer questions, giving someone a book, or simply sharing news, I’ll always feel I’m on the right side of promotional efforts if I’m doing the giving. That is the key word for me. GIVING. In order for promotional efforts to be authentic (hey look how much fun I’m having! ), and to have the panache to face the public when I know there are 1 star reviews hanging around for everyone else to read, will require the ability to let those negative reviews go. Or try not to read them. (Good luck, Donna, you know you’re too nosy) Maybe I’ll just back up and re-read the good ones, and hope that sort of balances things out and move on. On to *realizing I can’t fix everything. For example, right now I’m very hands on with my Facebook Author page. (www.facebook.com/donnadaviseverhart) So, today, I was responding to a couple new comments, and I sent an invitation to a new contact to Like the page. While I was poking around out there, FB has these analytics, and I checked that out. I actually felt a little lurch in my heart when I saw an Unlike. Geez. Already??? Somebody liked my page, then unliked it? My first thought was why? And, what can I do? I thought, well, if I know who, then I can reach out to them and maybe “fix” whatever caused them to unlike me. Okay, not me, it. But see? That’s the thin skinned part of me, and the fix it part of me reacting. Realistically, what can I do? Nothing. They have the right to do what they want. And for all I know, this was an unlike that went right back to a like. I just did that today. I liked the Southern Independent Book Alliance site, and then unliked them because I wanted to “Like” them via my Author Page. Of course I like them! I’m a brand new member! But, I think they would see that “unlike,” just like I did via the analytics. Now that I’ve shared all this, I ought to print it out and keep it where I can see it. then I should read it a few months from now and see if I still think the same way. It’s going to be interesting, that’s for sure. As a reader or an author, what do you think about book promotions? One of this morning’s winners, Ginger Martin, a friend of mine from my Nortel days, has graciously declined her ARC – which means I can give it to the next person who provided the right answer within the earliest time frame. Her reasoning? Well, she was one of my earliest readers, and said she’s already had a sneak peek. By early I mean, she read it when it had the “fatal flaw” (that was likely in 2010) and then again, when it became a little closer to what it is today, and that version was probably in 2011. Therefore, AJ Blythe – you’ve won the copy! Email me at deverhart2@nc.rr.com your address so I can send it on to you! The hints and the expanded picture seemed to do it! Three have correctly identify what is pictured below! Two via this blog in the comments and one on Twitter! YES! It is a cicada! I took this picture last summer. Tell me that is not the most unusual looking “face” on it’s back? Striking – and I suppose it’s there to scare off predators. Poor things…they’re eaten by EVERYTHING. Squirrels even. Gross. Ginger Martin – commented here on blog at 7:40 a.m.
Sarah Meral – commented via Twitter using #DIXIEDUPREE at 9:10 a.m.
AJ Blythe – commented here on blog at 9:37 a.m. Some of you JUST missed by a few minutes! Winners, please email me at deverhart2@nc.rr.com with your mailing address and I will send you a signed ARC! I hope you all had fun! I sure did – especially laughing at some of your crazy answers! I made no move to mark or signal in any way my father’s one year anniversary of passing. About three days before the official day, Mom and I went out to the grave site and swapped out the Christmas flowers for a selection of silk flowers I’d picked out, varying shades of off white, sunny yellow and deep blues. A Spring bouquet. I bent over and strained to see. Yes. Maybe that one corner was dipping into the rain sodden ground, ever so slightly. I whisked away a few strands of dead grass. A bug. A small bit of dirt. “There. That’s much better,” she said. We didn’t get that quiet time we wanted with Dad. Right beside his grave two men worked to prepare an “Opening.” They were polite, and kept about it, but it was hard to stand there and feel any sense of connection to Dad, so, we left. As is often the case when dealing with loss, those left behind, the ones impacted the most might tend to look for “signs.” Several weeks after Dad passed, when Mom’s grief had diminished to a more manageable sadness and she once again became more aware of her surroundings, she began finding pennies here and there. We were at a Minute Clinic at a CVS store for her to get a pneumonia shot, and while sitting in one of the little waiting chairs just outside the clinic, right in front of her feet – a penny. “Haven’t you heard about pennies from heaven?” she asked. Vaguely, I think I had…I wasn’t sure. She said after a loved one has passed, if you find pennies (or other change I guess) in odd places, it was a sign they were with you. “Hm,” said I, with some skepticism. It’s possible you could find spare change just about anywhere, if you looked hard enough. But then, a couple weeks later, we were standing in the backyard discussing what she was going to do about mulching and trimming, and there on the ground at our feet, another penny. In the grass. How odd. And still again, I took her to a store to pick up a few things, and as we waited in line to be checked out, what did we see? Yep. Another penny right by her foot. More recently, my brother and I accompanied her to a minor procedure. While she and I sat side by side in the waiting room, (my brother paced) there on the carpeted floor? Sigh. Yes. A penny. I have to admit, my hint of skepticism was waning. We’ve been dealing with the flu, here in the Everhart household. I recently washed a blanket I’d taken down from the closet to use one night when the fever spiked and I was certain death from freezing was imminent. After it was dry, I folded it back up and was putting it back on the closet shelf. In that closet hangs my Dad’s coat. The one I’d given him years ago, and the one he wore ALL the time – especially after he became ill and seemed to stay cold. After he passed, I told Mom I wanted it – sentimental reasons and all. I brought it home, washed it, dried it, and hung it up. It’s been in the closet over a year. I took it off the hanger, and something made me put it on. I shoved my hands into the pockets, and stood there a moment, breathing deep, wishing, in a way, that I hadn’t washed it because it only smelled of detergent. I wiggled my fingers in the left pocket and encountered a flat round object. I pulled it out and stared at what lay in my hand. Yes. A penny. I’ve been wrapped up, enamored with, and possibly swooning over “The Process” of publication. When I worked at Nortel, a Product Pipeline (it might have looked something like this-but there were many variations depending on the project manager) was often used to monitor the progress of products as they went through various stages of production. Ultimately, each one reached a final production phase which meant they were ready for delivery to a customer. I’ve pictured the process of publishing a book similar to what used to happen at Nortel. Of course there is a ton of work I’m not privy to, but I thought I’d share what I do know, and what was required of me as an author. Much of the time, there are many weeks of quiet which is great since I’m working on the new project. Every now and then though, I’ll get an email from someone at Kensington. This is always thrilling because it’s an indicator the book is moving along in their publication pipeline. The book now exists and is sent out via distribution channels to stores – and a box is sent to me! Pre-orders can be shipped October 25! I have found every part of this fascinating and of course, that has everything to do with the fact it’s my book, but I thought you might like to have a peek behind the scenes. Right now, it’s a bit like the lull before a storm because I know once I start promotional efforts, it will be all consuming. I’ve received some “insider” advice on what to do to begin early promotion of the book, so, I plan to spend the Spring and Summer visiting local bookstores to introduce myself, among other things. I’ve been working behind the scenes to transition my blog to a new and improved “website.” Across the top you’ll see the new “menu” items (The Book, About, Contact, etc. ), but I’ve also chosen a theme I hope will represent this new part of my writing career. I like simplicity. I like organization and structure. I like to have features lined up like little soldiers, and not too much clutter. The old blog was starting to look a little cluttered. Don’t get me wrong…I loved the old blog with my little lizard – okay, some called it a red eff, or maybe it’s a salamander, but the dark background and white font? Not so much. I have “The Book” as my static page for now. I am still poking around out here and so, if you see some further changes or rearrangements to content, that’s why. I’m not sure the blog will stay. It may go to a newsletter, and if so, I’ll be converting that space to a page that will say “Newsletter” and a form to sign up, and I hope you will! All that is up in the air right now because I like to chit chat, but I’m finding my time for that more limited. Take a little tour yourself, test out the social media features, and as always, let me know what you think – or if something didn’t work! On another blog a writer friend said she wished she could send all of us a big bag of Texas Trash – which made me realize it was time for me to share my own version – White Trash. Don’t I share this every year? I can’t remember, but if I don’t, it ought to be a tradition out here on the blog. I mean, just like what the title says…it’s not Christmas without it. Admittedly, this is probably not considered being politically correct, but, hey, how ’bout we go with the idea this isn’t about someone’s lifestyle, but a treat. And a darn good one if I say so myself. I think that about covers most of the ones I’ve heard. Don’t have time to bake and bake and bake like I’ve done this past week? (Six pound cakes and counting…) This is your answer! Anyway! Like I said, it’s easy! There are many versions of the recipe to boot, but here’s a favorite. Melt peanut butter and butter. Let cool. Pour over over cereal and mix carefully until well coated. Pour confectioner’s sugar into a bag (an old fashioned brown paper bag is perfect for this, but if you don’t have one, use a trash bag. Seems sort of apropos doesn’t it?) Dump coated cereal into the bag and shake vigorously. Voila! White Trash. Combine first three ingredients in large bowl or pan. Melt chocolate chips, butter and peanut butter. Let cool a bit, then drizzle over cereal mixture to coat, then mix carefully to coated. Next, dump box of confectioners sugar into…? You got it, a trash bag or paper bag. Then in goes the cereal mixture and shake until all is well coated. I went to the Redbox outside Walgreens just about a mile away looking for the movie CAKE with Jennifer Aniston. To my disappointment it was already checked out, and so I stood there a moment debating. I could go to the other Redbox outside the Hess Wilco gas station a block over, but I was tired. Instead, I decided to scroll through the remaining movies just to see if anything else caught my eye, and boy, did it. When had CHILD OF GOD been made into a movie? COG was the second book I’d ever read by Cormac McCarthy. The first was THE ROAD. Both prompted a McCarthy frenzy which sort of petered out before I read the last book I’d bought by him, BLOOD MERIDIAN. I’ve blogged about this in the past, with this book, and this one. I’d come away from those with a bit of burn out based on his repetitious style of writing. Granted, he can take a situation and for several hundred pages have you following along because sometimes you think, “it just can’t get any worse,” and then it does. He’s extraordinarily talented with revealing just how corrupt and backwards some individuals can be when forced to live at the edges of society. He writes about characters who are depraved, ignorant and typically desperate. At any rate, imagine my surprise as I stood there trying to decide since I can’t have CAKE, (ha) what’s it to be? And then I saw it,and my curiosity about how they could take a story like THAT and make a movie of it won out. I rented it. I figured James Franco directed, I can’t go wrong. Just like with books, I don’t typically rely on the ratings too much. It was a little surprising however, when I got home and searched for the movie’s release date (2014), to see that Rotten Tomatoes reviewers gave it two stars. And reviewers who use IMDb ranked it at 5.4 out of 10. I watched the trailer. I thought it looked pretty good. Maybe it’s the extraordinarily tasteless acts ole Lester Ballard engages in that has turned folks off. If nothing else, you got to hand it to McCarthy for going “there.” No one else has, not that I know of. I thought certain topics were taboo and he proved that’s not the case necessarily. I’ll hand McCarthy this. He writes as if everyone he knows, or anyone who might judge him is dead. There is no topic off limits. As a writer, I’ve yet to learn this. I think twice before I word something a certain way. I write a scene over and over and over with the thought, “who might read this? Oh, yeah, them.” DELETE. I want to learn to write like no one’s looking over my shoulder. With all the controversy swirling around I can’t say I want to read this any more than I did when I pre-ordered it weeks ago. 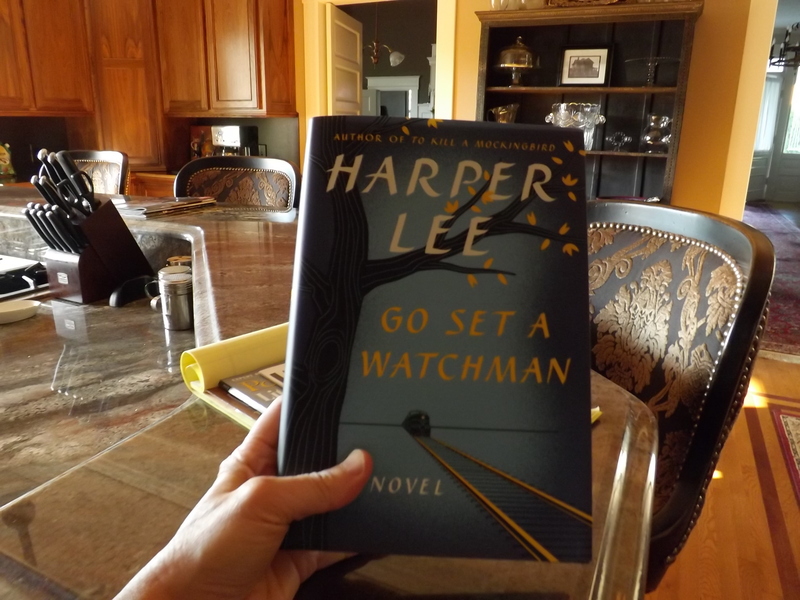 I mean, I’ve always wanted to read another book by Harper Lee, and so, from the initial “discovery” of the manuscript to this copy held in my hands, I’m happy. Right now, anyway. If I am perhaps more anxious to hurry up and read, it’s only so I can form my own opinion, particularly now that I know I’ll read about a different Atticus Finch. From what I understand, he won’t be the upstanding man portrayed in MOCKINGBIRD. He’s stood on the pedestal of justice we built for him with righteousness and one could imagine even, conviction. What a huge burden he’s carried all these fifty some years, what with living under false pretenses. I guess that’s the issue. I don’t really know other than what I’ve seen on TV or read in the paper. The editor did right by Harper Lee. She gave her the advice any writer would want – the ability to look at a manuscript and see the story that was needed for that point in time. You know what I’m most fascinated by? That index card I saw, the one with the typed notes about GSAW and the fifty or so page increments brought in to the publisher, those notes that stated something like, “brought in by author” with the date, etc. What an artifact! The index card was shown on CBS morning news the day of the book’s release and I was SO hoping someone would flip that thing over so I could pause my TV and read the rest of what it said. That is, in my opinion, a real piece of history, something that shouldn’t be lost. They should have made bookmarks out of it and provided one to all us readers who’ve bought the book! Anyway, I’m currently reading COMING OF AGE IN MISSISSIPPI by Ann Moody which is another eye opener, and I’m only about halfway done. Whenever I get into GSAW and finish, I’ll be sure to throw in my two cents worth here. After all, I’ve only read MOCKINGBIRD about five times now, the last time when the 50th Anniversary edition came out and I bought it, remembering it as one of my favorite all time reads as a child, not to mention the movie with Gregory Peck. I hope I’m not disappointed by WATCHMAN. I plan to steer clear of reading too much more about all of it beforehand. In some small way, I’m a bit stupefied by the “shock” of the press over the so called “plot twist” about Atticus’ true nature. At this point in time it sounds a lot like the typical path taken by a writer who worked with an editor to produce the best book she possibly could. Newsflash, this still happens today – except we don’t drop into a publisher, we email our work. The rest is the same. Editors help us produce a better book. And excuse the pun, but, end of story, right? Doesn’t that make all this really much ado about nothing?